Colleran: "You got to have new product in this environment." Mike Colleran joined General Motors in 1989, the year GM invested in Saab, and has been part of the Saab organization in the United States since 2005. Now he's in charge of steering the brand in North America under a new owner, Dutch sports car maker Spyker Cars, whose February purchase from GM saved the Swedish automaker from a shutdown. How much damage was done to the Saab brand during the past 18 months? It is difficult to understand the complete depth of that damage. Certainly the brand did suffer. Consumers heard General Motors was going to take it through a strategic review. They heard, along the way, of a potential sale which was greeted with euphoria. Then the Spyker deal, again treated with a lot of euphoria, and then the collapse (of the Spyker deal in December). I think consumers went through kind of a roller coaster ride. It tends to shake your faith just a little bit. And, then clearly the dealer network. From the North American standpoint, product ordering stopped in spring 2009. So by June 2009, the last of the new Saabs had arrived and no 2010 models were ordered until just after the sale was transacted. So dealers were without new inventory for almost all of the 2010 model year. But clearly when you have all of the negative press that is out there surrounding the bankruptcy, and the words like “liquidation,” it really hurt the dealers. What will help improve Saab's image? Just getting new product into the pipeline is a biggie. You've got to get the product to the stores. We are preparing for the 9-5 launch in July. So while we have done some of the basic blocking and tackling of marketing since February, we are preparing for a 9-5 launch, a full-blown launch. We will have all the components of a launch — dealer events, consumer events, TV, print and all of those things. In terms of image, what else has to be fixed? Awareness that we are here. I think there are a number of consumers who have the perception that Saab is gone. There are a number of ways. I think you can activate those who really know you and really love you. You can activate social media. So working through Facebook and Twitter, all of those different sites, allows those who love you to talk for you. You have to do the traditional things as well. You have to get out in front of the press. And then I think you have to go in some of the traditional (advertising) venues like TV, news print, radio. We are doing work there now. 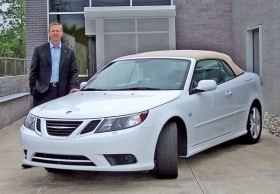 What else is Saab doing to rebuild the business? You got to have product. You got to have new product in this environment. So the key piece of this is getting that new product in the pipeline, the 9-5, followed by the 9-4X crossover in April and then followed by an all new 9-3 in 2012. Two years from now, the oldest product on the showroom floor will be the new 9-5. What an amazing change. But you have to do some other things. You've got to instill confidence in the consumers that they can buy these cars and not be concerned about buying the cars. What is the competitive set for the new 9-5? The (Audi) A6 is the main competitor. When an A6 customer looks at the way the new 9-5 is going to handle and ride, that is the vehicle they are going to compare it against. BMW 5 series, I think. Volvo S80 I think is right in there. The old 9-3 and the old 9-5 were really pretty close in size, close in terms of specifications, and frankly even in pricing. I am not sure we really were participating in two segments. We really now have two segments to compete in. We actually go from having two cars really close to each other, and maybe even on top of each other, to having two complete distinct entries in two distinct segments. The base 9-5 will start just under $40,000 and can go into the mid-$50s. GM will assemble the upcoming Saab 9-4X crossover in Mexico. What other ties does Saab have to GM? There is obviously no control by General Motors. General Motors is providing the 9-4X. Essentially General Motors has offered to provide servicesthat it provided in the past for a price. Data base management services, some service operations, IT services, some of the systems that support our dealers and support our day-to-day work. You just can‘t reinvent those overnight. So we rent those back from General Motors at a price. What is the U.S. sales goal this calendar year? We have not released a sales goal. We are not comfortable because it is so early in the process. But we have 15,000 units of production available to us. It would be our fair share of 100,000 (units) so we would be looking in the 20,000 to 25,000 range. So while we are not releasing sales targets yet, production targets to some extent define what you will sell. When we get to 2012, I want to be cranking out 35,000, 40,000 units at a minimum here in North America. Are all Saab dealers using GMAC? No. GMAC is our preferred partner. I would say roughly three quarters of the dealers use GMAC for wholesale. And then on the retail side, dealers are free to choose whomever they want. The Euro is declining against the dollar. How is that affecting your U.S. It is clearly working in Saab North America's favor. As the Euro continues to struggle against the dollar, that provides us with a better business case. We set up the business case at a much less favorable dollar-Euro situation, and now it is 7 or 8 percent better (than Saab expected). That is significant. So it is very good for us. How many U.S. dealers does Saab have? All of the dealers are signed up. We have 207 dealerships. We have dealerships that we will probably lose by the end of the year. Some are just too damaged. I think by the end of the year we are going to be just around 200 dealers. Will Spyker's name appear in any of Saab's advertising? The brands will remain totally separate. We have the Spyker logo in the building because they are the parent company. We are not operating any Spyker business out of here whatsoever, and there is no intent to do that.